Background: A new ultrasonic device, Harmonic Focus®+, has been developed that is smaller and delivers energy more efficiently than its predecessor via the inclusion of Adaptive Tissue Technology. This study was undertaken to compare its dissection capabilities to an advanced bipolar electrosurgery device in benchtop and preclinical evaluations. Methods: In ex vivo testing, Focus+ and LigaSure™ Small Jaw were evaluated for physical dimensions, device and tissue temperature after repeated applications to porcine jejunum, and burst pressure of vessel seals, transection time, and tissue sticking in 3–5 mm porcine carotid arteries. In in vivo testing, the devices were tested on intact porcine carotid arteries for thermal damage via collagen denaturation and in muscle incisions near rat sciatic nerve for acute inflammation via hematoxylin and eosin and for impaired axonal transport via β-APP. Results: Focus+ was smaller than the Small Jaw in width and height, yet it had a longer active blade and larger jaw aperture. Device temperatures were not different after application, but thermal spread (tissue temperature above 50°C) was 78% greater for Small Jaw (9.6 mm) than for Focus+ (5.4 mm). Burst pressures of sealed vessels were not significantly different between the devices: 900 (±466) mmHg for Focus+ versus 974 (±500) mmHg for Small Jaw. Small Jaw had a shorter individual transection time (5.0 seconds compared to 6.3 seconds for Focus+), whereas Focus+ had 70% less tissue sticking. Thermal damage, neural inflammation, and impaired axonal transport were all significantly lower for Focus+ compared to Small Jaw, by 19%, 57%, and 50%, respectively. Conclusion: With the addition of Adaptive Tissue Technology, Harmonic Focus+ builds upon the manifold advantages of ultrasonic devices in procedures requiring meticulous dissecting capability. Improvements in energy sensing and controlled delivery produce lower tissue temperatures and less thermal damage, especially critical when working near nerves. 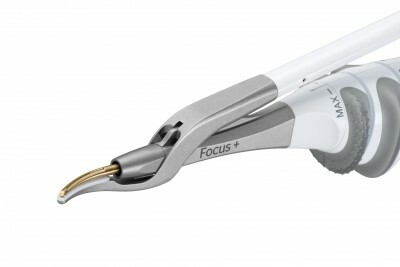 Focus+ produces vessel seal strengths equivalent to advanced bipolar devices and, although individual device activations are longer, the reduction in tissue sticking is expected to materially lessen operative time in clinical practice.